There’s no need to fork out on expensive healthy vegan snacks when you can whip some up in minutes. 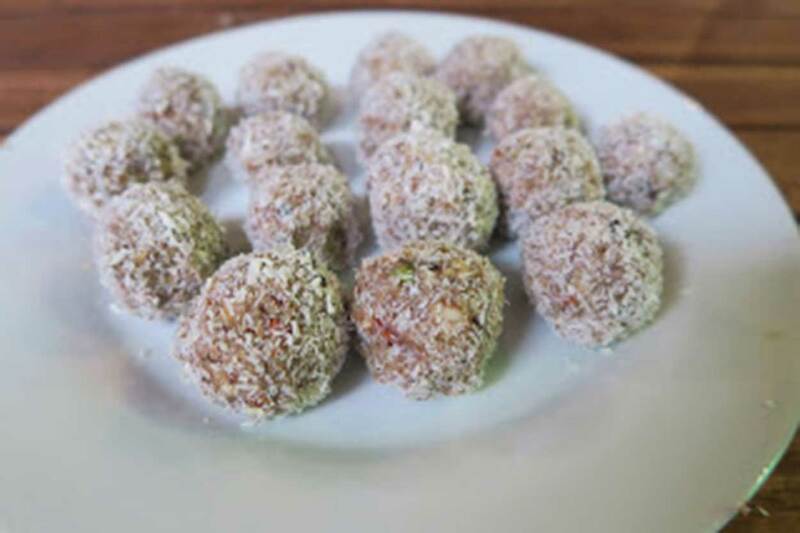 The best bit about these nutritious protein balls is that you can substitute any of the ingredients for whatever you find in your cupboard or supermarket (within reason of course). One of our attendees suggested adding rum to the cacao balls, not a bad shout! We made ours using the amazing Vitamix but you can use any high powered food processor or blender. Most of these will keep in the fridge for around a week, or can be frozen. Blend the apricots and 1/2 cup of coconut in a food processor, until they are combined and smooth in texture. You may need to add a little extra water. Place the additional ¼ cup of coconut onto a tray or large plate. Roll the apricot mixture into balls (about a heaped teaspoon per ball). Place the balls onto the tray where you put the additional coconut. Roll the balls until they’re all covered in coconut. Serve straight away or place the apricot balls into an air tight container and refrigerate. Blend all of the ingredients in a food processor until smooth. Roll into small balls and place on aluminium foil on a baking sheet. Refrigerate until set and keep refrigerated until ready to eat. You can roll in extra desiccated coconut to finish. If using fresh apple, blitz in the food processor and place between a few sheets of kitchen roll to absorb the excess moisture. Break the nuts down in a food processor. Add the rest of the ingredients and mix until a dough forms. Roll into balls. Refrigerate. Combine all the ingredients in a food processor. Pulse until the almonds are in very small pieces and the mixture holds together when squeezed. Using wet hands, form into twelve 1-inch balls.